…the monkeys are finally finished and I'm glad to say they are already quickly diminishing! I'm glad to say that because it means that very soon I will have a sofa back that they have been using as their home for the past… heaven knows how long! Take a look and either email or facebook me and I'll reserve one for you if you want one! This is Lenny below! Thanks for looking and waiting so patiently for me to finish this batch… this batch… the final ever batch… do you believe me?!? Right, bags next me thinks! 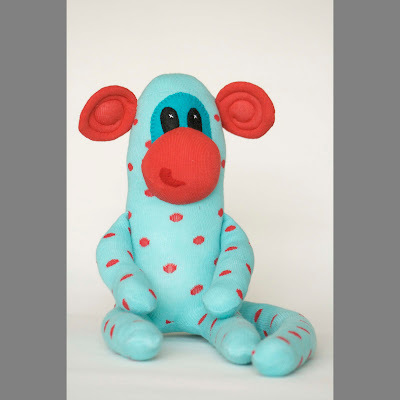 Ps the monkeys are on the sock monkey page or click on the image above! I have Facebooked you as there is space on my sofa for 2 monkeys! They are truly adorable. Bags. bags and more bags!